Among those with concerns was Pat Cipollone, the White House counsel, who shared that it was opposed by the new attorney general, William P. Barr. Vice President Mike Pence was concerned about the political ramifications of moving ahead without a strategy or a plan to handle the suddenly uninsured if the suit succeeds. 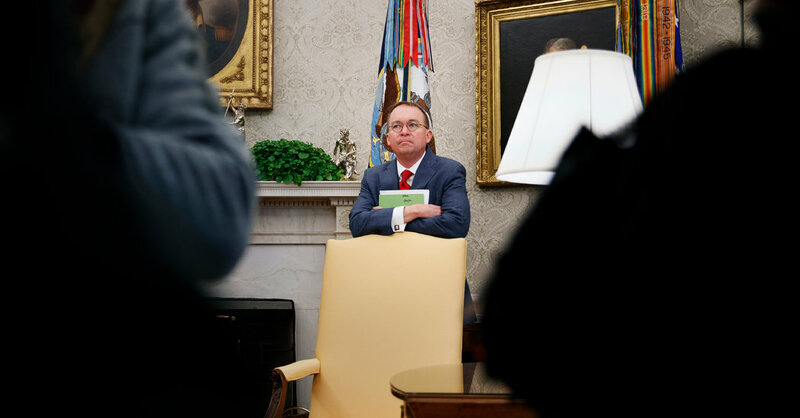 That meeting was followed by a smaller one, where Mr. Mulvaney and Mr. Cipollone were among those voicing different opinions. But Mr. Trump had been sold, and on Monday night, the Justice Department issued a statement saying it supports the Texas judge’s decision. On Wednesday, Mr. Trump doubled down on his support for the Texas suit while talking to reporters in the Oval Office. “If the Supreme Court rules that Obamacare is out, we’ll have a plan that is far better than Obamacare,” he said. White House press aides did not immediately respond to a request for comment. And one official, who asked for anonymity to speak about the meetings, insisted that Mr. Mulvaney had simply been convening people with various views so that the president could make his own decision. But Mr. Mulvaney was described as leading the charge to back it, in an account of the two meetings that was described by a half-dozen people with knowledge of what took place. Politico first reported that Mr. Mulvaney pushed Mr. Trump to get involved in the suit. Mr. Barr did not favor the move but did not object to the White House decision once it had been made, people familiar with what took place said. And one White House official said that the administration faced a deadline imposed by the court if it wanted to support the suit. But the decision to thrust Mr. Trump’s administration directly into the lawsuit caught several people inside the White House by surprise, and took the focus off what was arguably the best weekend of the Trump presidency after the delivery of the report by the special counsel, Robert S. Mueller III. Mr. Mueller, according to a letter by Mr. Barr, found no evidence of criminal conspiracy between the Trump campaign and the Russian government. But Republicans in Congress have no obvious road forward on legislation to replace the Affordable Care Act that could pass the Democrat-controlled House. And House leaders have little political incentive to bow to Republican wishes on health care, an issue that they believe delivered their House majority and that they are eager to campaign on in 2020. The Trump administration has tried to minimize and contain the Affordable Care Act over time. The president has been in favor of previous efforts to end the act. But the internal debate about the current suit also highlights a growing chasm between Mr. Mulvaney and Mr. Cipollone, according to administration officials. Mr. Mulvaney has built up over time his internal political capital, and he has grown his team of personal loyalists with new staff members.